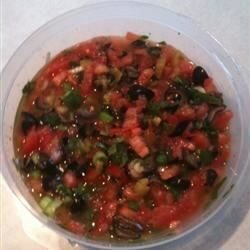 "This delicious salsa dip is easy to make and blends the distinctive flavors of tarragon vinegar, green chile peppers and black olives in a zesty tomato mixture. Serve with tortilla chips." In a medium bowl, mix together tomatoes, green onions, olive oil, tarragon vinegar, green chile peppers, black olives, garlic salt and salt. Cover and refrigerate 6 hours or overnight before serving. Big hit at our Memorial Day BBQ! This recipe is my most requested dip. Also try serving it with Scoops for a different taste! This is a wonderful salsa and very easy to make. It's perfect for getogethers. I love it...all I added was a few chopped sprigs of cilantro. Awesome! I really love this salsa. It needed some zest added.